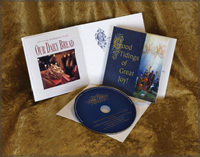 This card features six rich instrumentals of favorite holiday music on one CD, and five Christmas-theme devotions from the pages of Our Daily Bread. The greeting card reads, “Angels sang in wonder, God’s melody of love lay wrapped in swaddling clothes. Heaven’s song had come to us. Unwrap the joy of Jesus this Christmas.” There’s even room to jot down your own greeting. Share the greatest gift this holiday season. The First Noel/Go, Tell It On the Mountain.